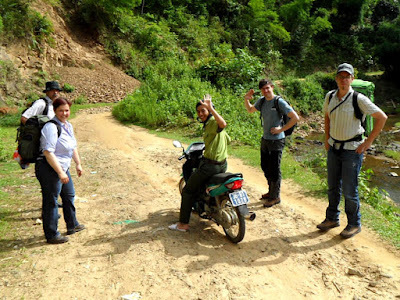 ACTIVETRAVEL ASIA and GIZ (Gesellschaft für Internationale Zusammenarbeit in Vietnam) working together in a survey of responsible tourism project in Pu Hu Nature Reserve, Thanh hoa province, Vietnam. The survey trip will be held in middle of December, 2011 by ATA team with support of GIZ Vietnam. ATA inspection team will spend about 3 days to scan this area, evaluating the suitable activities for a tourist site. This activity is a part of project “Protection of the forest and wildlife” implemented by GIZ Vietnam, under the management of Forest Protection Department of Thanh Hoa Province. Pu Hu Nature Reserve is situated in the North-West of Thanh Hoa Province. It has a big diversity of plants and animals with 508 plant species and 266 animals species. It also has a role in protecting the catchment of the Ma river. The inhabitants of the nature reserve and buffer zone belong to the Thai, Hmong, Dao and Kinh ethnic groups. The tourist will discover illegal cutting of trees, hunting and other illegal activities in the forest. Their movement in the forest will help to keep these illegal activities under control and is therefore very important! After the trip, ATA inspection team is going to propose interesting activities, suitable routes which would make Pu Hu nature reserve to be a tourist site. ATA also works with GIZ Vietnam to run and manage the potential trip tours here to complete one of the most important parts of project.